Keywords: Mobile phone art, mobile phone installations, mobile phone artwork, mobile phone performance, ringtone performance, performance art, installation. Frauke Behrendt has written a Master's thesis on this topic, focusing especially on the use of mobile devices for sound art: Handymusik: Klangkunst und 'Mobile Devices'. Epos Music Series, Electronic Publishing Osnabrück, 2004. ISBN: 3-923486-03-0. Adriana Souza e Silva has also written about this topic in her article "Art by Telephone: From Static to Mobile Interfaces", Leonardo Electronic Almanac v.12, no.10., October 2004. Sumanth Gopinath has written an excellent critical article for First Monday, available here: Ringtones, or the auditory logic of globalization, October 2005. About 10-20 cellphones are laid nose-to-toe in a circle. Ambient sound and the voices of the participants are input into the cellphone mouthpieces. Sound is propagated through the phones, becoming delayed and distorted in the resulting feedback loop. Calls may be initiated in a variety of patterns (neighbour to neighbour or across the circle) with different results. 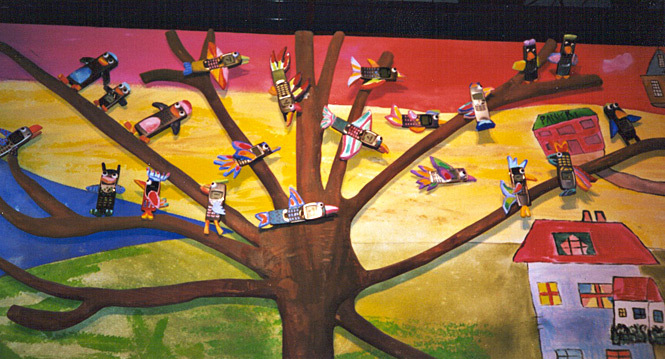 Several dozen mobile phones were decorated by children to look like birds, and suspended in a tree-shaped installation at the Hannover Expo. The phones were assigned ringtones resembling the sounds of birds, and caused to ring at occasional intervals. 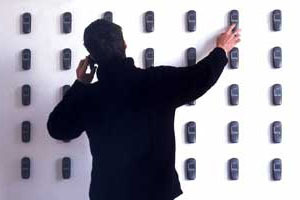 Gallery visitors are invited to dial a wall based grid of 42 Siemens mobile telephones, which in turn begin to call each other and create a piece of music. Each phone has been individually programmed with a different ringtone, which played en-masse, create various harmonic layers all of which are based in some way on the popular and prevalent NokiaTune. A traditional symphony orchestra performed a 10-minute medley of classical tunes. Amplified recordings of ringtone melodies were used to start off the first few bars of each section of the concerto. "The Exchange" combines live performance with the potential of mobile phones. In the piece, which is a strictly timed musical improvisation, one live performer on stage interacts with telephone calls from other performers and artists who can be anywhere on the planet. They call at specific moments with specific contributions. Meanwhile, other artists send images of these performers and their performances, as they happen, by phone. Seven computer-synchronized phones performed a one-minute composition on a televised promotional event. In a concert and sound installation, twenty mobile phones were suspended from a ceiling. These were caused to ring by a live performer, who dialed them up using another four phones below. 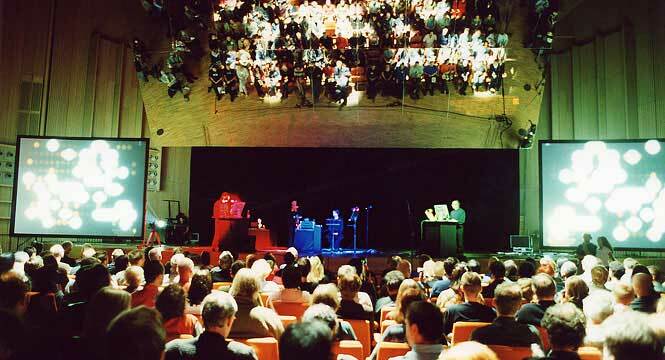 A 28-minute concert was produced through the ringing of 200 visitors' phones. Before the concert, participants registered their personal phone numbers into a database, and automatically received new ringtones and printed seating assignments. During the concert, the participants' phones were dialed in various patterns by two live performers, who used custom software that allowed any combination of up to 60 phones to be dialed simultaneously. The orchestra of participants was accompanied by a soloist who performed live on six amplified but unmodified phones. Several hundred people gathered at a public square in an attempt to set a world record for the most phones ringing at the same time. A "cloud" of 1200 Siemens mobile telephones were suspended under the glass dome in the Berlin Communication Museum. The phones react sonically to the movements and dialings of the crowd below. A series of seventeen 20-minute concerts was presented over two weeks. Ninety-nine preconfigured mobile phones were distributed to the audience in a precise spatial pattern; these phones were dialed by a live performer using custom software. The participants were accompanied by a soloist who performed live on twelve amplified but unmodified phones. The artist writes: "Musical/Devices allows you to collaborate in a musical composition with other people using any telephone. The project allows for multiple users to participate in one experience through a mobile device. Users call up and connect to the program and can select a high or low pitch note. Once they choose a tone, the tone is released into the main screen and when the bouncing ball collides with it, it produces the appropriate high or low pitch sound. The system uses VoiceXML (a subset of XML) through TellMe and speech recognition to decipher user input in the form of voice or DTMF tones. Once the user connects, they are prompted to say "high" to generate a high pitch sound or to say "low" to generate a low pitch sound. Once the VXML gets an answer it recognizes it writes to a CGI script and relays that message to the movie." Owners of 30 phones, onstage, triggered ringtones from their phones according to a pre-composed composition. A mobile phone enabled image mixer for public space. Phonetic Faces is an interactive mobile visual installation in public space that allows people to both contribute their image to a shared display and collaborate with others to create a collage of images using their mobile phones. While in front of the installation, visitors call a free 1-890 number which prompts them to choose images to collage together and allows them to take a new picture of themselves to add the archive. The installation allows up to four people to simultaneously call in and chose photographs to add to the evolving collage. The result is a visual composition of visitors over time to the installation. Ideally, the project would be installed in a public space such as a bus stop or another "waiting" point to allow for a constant influx of new images and collages to collect over time. „Dial the Signals!“ was a temporary installation of a radio station, 144 mobile phones, numerous radios and the listeners of the free radio FSK, being all part of a complex instrument. The radio concert had an explicit beginning and ending. The audience could take in the concert part via phone from any place. During 12 hours, from Saturday evening 20pm to Sunday morning 8am 144 mobile phones could be reached via 144 phone numbers. The phone numbers of the mobile phones had been published before, so that the listeners could directly address the mobiles and enable the concert and also navigate the concert. It consisted exclusively of the ring tone of the calling mobiles. There was no other superior entity, having direct access to the creation of sounds. The aim was to make evident that the radio concert is not only received dispersively, but also played dispersively. A German conductor is incorporating mobile phone ringtones into his orchestra's performances. Bernd Kremling, who runs the Drumming Hands orchestra in Wuerzburg, used ringtones ranging from Bach and Mozart to Old McDonald Had a Farm. Some phones are set off by the musicians but others have to be rung from backstage at the right moment to set off their sound. During a recent performance in Bayreuth, reception was so low that part of the work remained unperformed. Performer Tim Didymus conducted a live concert featuring music and sounds generated entirely on-the-fly from a mobile phone application. US-based Tao Group is behind the technology, called Intent Sound System (iSS), a suite of audio technologies that makes it possible to relay music composed live and in high quality through a mobile phone. SimpleTEXT is a collaborative audio/visual public performance that relies on audience participation through input from their mobile phones. The project focuses on connecting people in shared spaces by attempting to merge distributed devices with creative and collaborative experience. SimpleTEXT focuses on dynamic input from participants as essential to the overall output. The result is a public, shared performance where audience members interact by sending SMS, text, or voice to a central server from their input devices. These messages are then dynamically mixed, cut, parsed, and spliced to influence and change the visual and audio output. 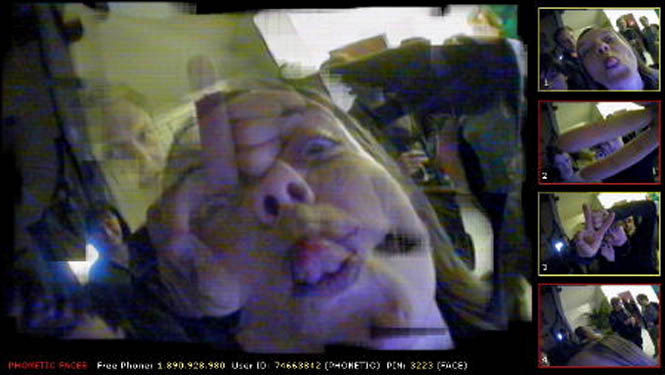 These communications are also run through a speech synthesizer and a picture synthesizer. The incoming images and text are dynamically mixed according to specified rule sets such as pixel values, length of text, specified keywords, and inherent meanings. Jeff Gates explores the vernacular language of mobile phone use, performing one-sided imaginary conversations in public places. Interestingly, Gates performs the absence of mobile phones. He writes: "Every month I perform a monodialog on the subway: a repertoire of mobile phone conversations culled from reality. Putting my finger to my ear (no one will look closely to discover I have no phone) I produce pithy and topical urbane conversations. When my audience ignores me I know I am a success." 15 Sep 2004: Greenwich Park, London. This project visualizes electromagnetic transmissions in the atmosphere. Sky Ear is a non-rigid carbon-fibre "cloud", embedded with one thousand glowing helium balloons and several dozen mobile phones. The balloons contain miniature sensor circuits that respond to electromagnetic fields, particularly those of mobile phones. When activated, the sensor circuits co-ordinate to cause ultra-bright coloured LEDs to illuminate. The 30m cloud glows and flickers brightly as it floats across the sky. As people using phones at ground-level call into the cloud (flying up to 100m above them) they are able to listen to distant natural electromagnetic sounds of the sky (including whistlers and spherics). Their mobile phone calls change the local hertzian topography; these disturbances in the electromagnetic fields inside the cloud alter the glow patterns of that part of the balloon cloud. Feedback within the sensor network creates ripples of light reminiscent of rumbling thunder and flashes of lightning. Sky Ear shows both how a natural invisible electromagnetism pervades our environment and also how our mobile phone calls and text messages delicately affect the new and existing electromagnetic fields. Rock music performance transmitted over mobile phones. 3 November 2004, Institute for Contemporary Art (ICA), London. The four-piece boyband Rooster broadcasted a live 45-minute gig, over mobile phone video services. Ten minutes before the performance was scheduled to start, 10,000 pre-registrants were sent an SMS which invited them to pay £5 to view the concert. Only the first 1,000 customers were admitted. Rooster, a London-based four-piece rock band, were chosen because Mobile Service Provider 3 is already in partnership with their record label, BMG. Rooster are one of the label's most hotly tipped young acts, with their potentially lucrative combination of boyband good looks and an eminently palatable style of music they have termed "griff rock". 3's spokesperson admitted: "They're quite good-looking young guys, so it made sense to have them on video." JERUSALEM (AP) -- A national obsession entered Israeli high culture Friday when an orchestra performed a cell phone "symphony." Each section of the 10-minute medley, titled "Spring Cellphony," began with a cell phone ring to the tune of a classical music piece, and the orchestra carried on from there. The medley was performed before hundreds of phone-toting Israelis at the opening of a technology exhibition in Jerusalem. Israelis have fallen hard for the mobile phone in the last decade. More than two-thirds of all Israelis have cellular service, and wireless accounts now exceed land lines by 50 percent. It is not uncommon for people to carry two phones. After all, always being on the phone means you are impossible to reach. The average Israeli subscriber talks for 314 minutes per month, more than 2.5 times longer than the average in Europe. In a nation full of news junkies, cell phones are just another way to feel plugged in. "It's a disease," said Isaacs Michael of Jerusalem, who attended Friday's performance at the Bloomfield Science Museum. A large symphony orchestra featuring violins, cellos, flutes and trombones was accompanied by recorded sounds. The piece opened with the digital hum of the "William Tell Overture," and included five-second cellular samples from Bach and Mozart. As Friday's performance wound down, a cell phone rang loudly. The conductor stopped, pivoted and shot a dirty look at the audience. It was part of the performance, of course--a joke about the extent to which technology has invaded all parts of Israeli life. 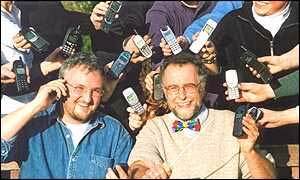 Virgin Mobile is hoping to create a new World Record next Wednesday for the most mobile phones ringing in unison. The attempt - to be adjudicated by boffins from Guinness World Records - is expected to attract a couple of hundred people to London's Leicester Square next Wednesday at midday. However, since there is no existing record for the largest number of people gathered in one place with their mobile phones going off, there seems little chance that this record attempt will fail. Which is a shame, for then there will be no call for headlines such as "The Big Ring shafted in record blunder". No matter. Instead, what we will have to look forward to is scores of people milling around central London shouting: "I can't hear you, I'm on the mobile." A Virgin spokeswoman told El Reg that ear plugs would be provided for those taking part. However, we're more concerned about the poor sods walking past when this diddle-ee nonsense kicks off. A British composer is planning a "New Ring Cycle" -- a symphony composed from the ringing tones of 30 mobile phones. Composer Simon Turner and writer Marcus Moore are to give "SIM-phone-ya" its world premiere at a music festival in July. "The work is supposed to be a bit of fun," Moore told Monday’s Times newspaper. "You hear these things go off every day so (we thought) perhaps we could use them to do something more interesting." They plan to invite 30 mobile phone owners to play the ring tones in the as-yet unwritten piece. This catalog is a work in progress. If you know of any other mobile phone artworks with good web documentation, please send me an email and I'll add it to this list. I can be reached at golan at this domain name. Thanks to the many individual artists who have contacted me about their work, and to Jonah Brucker-Cohen and Frauke Behrendt for their pointers to additional projects. Please click here for other informal catalogues by Golan Levin.